With many players unavailable for our Round 6 fixture vs Fairfield, the Waratah’s depth was tested over the weekend as many debutants featured across all grades. A very strong performance across the board, sees us set up for a great chance of snaring points in all 5 grades. Our First Grade side enjoyed the return of our test spinner in Steven O’Keefe (4/42), who along with Joel Foster (4/29) led the home side to a strong bowling performance, knocking over Fairfield for 185. Unfortunately we lost our back to back centurion in Weston just before the close of play, with Farrell and First Grade’s highly notable #3, Jake Carden the men at the crease. Second Grade rocked up to a minefield at Rosedale, and after being sent into bat on a very tough wicket, they clawed their way to a strong total of 157, with Kaye (33), Herd (30) and Jamieson (34*) leading the fight. All bowlers bowled superbly with Jamieson the pick once again taking 2/19. Fairfield needing another 54 for victory with just 3 wickets in hand. Third Grade had a strong day down at atmosphere park, posting their highest total for the season thus far. Mendel (63 on debut) and Hole (46) shared a great opening stand which set the day up perfectly for the remaining batsmen. Trewartha (50), Edwards (43), Beatty (29) and McLachlan (27) also provided valuable contributions. Fourth Grade toiled hard with Gummer (61) and Wheeler (33) helping the Tah’s to a defendable total of 152. Fairfield are 1/4 overnight. Fifth Grade were led well again by the ever reliable Dylan Marshall (4/52), who along with Jack Hobson (3/22) bowled superbly to keep Fairfield to just 188. Joel Mason enjoyed his return to grade cricket and is 16* overnight. No doubt some swashbuckling cover drives just before the close of play. PG’s kept their season alive with a very important win over a strong Sutherland side, featuring our own Aiden Bariol. After another big collapse, the boys were saved by a very impressive batting display from Joey Graham (65) who helped the Tah’s to a defendable score of 193. Aaron Beard also chipped in nicely with the bat scoring 48. Our bowlers were impeccable and strangled Sutherland to have them all out for 111 in the 39th. Joel Foster was the pick of the bowlers picking up another 4 wicket haul. With 1 game remaining, the hopes of finals cricket for our U/21’s side are still alive. Finally, our womens side suffered a heavy defeat to St George. After being bowled out for 56, St George were 6/156 at the end of the days play, finishing with first innings points. We are confident the girls will bounce back next week. Overall a very strong weekend for the reigning Club Champs. Victories a big possibility in all 5 Grades which will see us climb back up the Club Championship ladder after a slow start to the season. 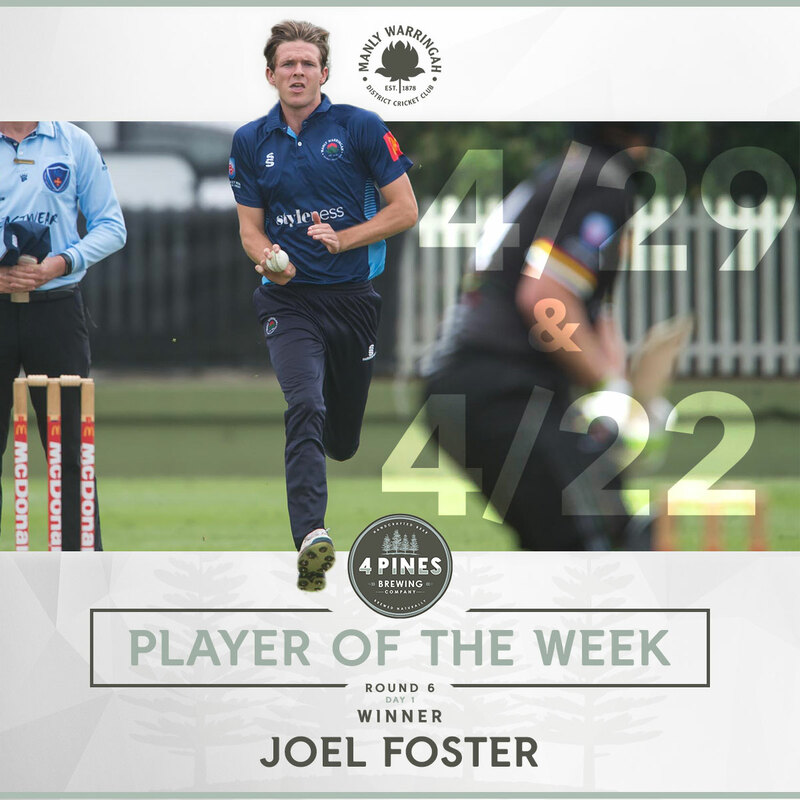 This week’s 4 Pines Player of the Week is awarded to First Grade and PG’s all-rounder Joel Foster. Fozz was exceptional over the weekend, taking an impressive 4/29 on Saturday to help First Grade restrict Fairfield to just 185. He backed up well Sunday taking a further 4/22 from his 10 overs, whilst leading the PG’s side to a potential season saving victory. Fozz has had a strong start to the season with both bat and ball and will continue to play a huge role for both our First Grade and Poidevan Gray sides. irst Grade were excited to be back at home to take on Fairfield with a few new faces in the team, Max Webber and Aaron Beard making their first grade Debuts. Manly were to bowl first and it wasn’t long until Viss did what Viss always does and snicked off one of the opening batsmen. We bowled with good lines and good lengths on a reasonably slow wicket. This pressure lead to a quick succession of wickets to Joel Foster and skipper Stephen O’Keefe. At Lunch the Tah’s were in a good position with Fairfield 4 down for 60. After lunch SOK took and early wicket but then Fairfield put on a bit of a partnership all the way until tea. After tea Fairfield tried to pick up the run rate a bit but this lead to a few wickets and Manly got rewarded for their patient bowling. SOK and Foz took 4 wickets each to finish of the innings. This meant Manly had 8 overs to bat at the end of the day. This didn’t start well with the Inform Logan Weston falling LBW second Ball. Night watchman Jake Carden and Ryan Farrell batted out the remaining overs to leave the Tahs 1/9 at the end of the day. he mighty 2’s rocked up to Rosedale oval, keen to bounce back from a disappointing few weeks against Mosman and Parramatta. Our beloved Sweet Chilli Willy was at his officiating best and with a debutant in Matt Brewster joining the side, his iconic dragon welcome was also in full flight. Vibes were good throughout the warm-up and the day was looking to be a good one. After a confusing toss, it was later confirmed that we were indeed sent into bat after they elected to bowl then proceeded to warm up with throw downs. Gainsford also confused about what the outcome was, nonetheless a very village start to the day. A new look opening pair of Gainsford and Hole started off the day with Gainsford unfortunately falling early after dodging a good 5-10 explosions off the wicket. Kaye joined Hole at the crease as the pair continued to toil in very very difficult batting conditions. Hole, Virdi and Vumbaca all fell within a quick space of time which saw newcomer Elliot Herd enter the crease. Kaye and Herd batted positively and counter-attacked Fairfield’s bowlers nicely before both men were unfortunately dismissed just before the lunch interval. With the score at 6/81 at Lunch, we were in a spot of bother. Hicks, Brewster and Jamieson all provided valuable runs after lunch, helping us reach what was a strong total of 157. The boys were keen to rip in after a certain loudmouth decided to get into us about our ticker. We were fired up and with all bowlers maintaining great discipline throughout the day, we left day 1 well and truly on top of the game with Fairfield 7/103 overnight. A big first hour next week should see us walk away with first innings points and hopefully a further result with second innings points also a possibility. Overall a superb team performance in tough conditions. Looking forward to Day 2.
he date was November 17th, the year of our lord 2018, and the mighty 3’s arrived to Graham’s Reserve understanding the gravity of the fixture against the Fairfield-Liverpool Lions. With humidity hovering around a balmy 79%, and the chance of rain dwindling to a mere 12%, Captain Nicholas McLachlan won his second consecutive toss (a personal record under his leadership) and decided that today would be fought with willow in hand. With rumours swirling that domestic T20 superstar Liam Hatcher was in the XI to take down the Waratahs star top-order, nerves were rife. They were, however, quickly put to bed when he did not warm-up the shoulder, to the relief of Sam ‘The Better’ Hole in particular. Alas, the days play got under way, and it was the debutant Brynn ‘ Beautiful Salad’ Mendel (63) who set the tone with an array of graceful stroke play, particularly through the cover region. The young man combined with Hole (46) to blunt the Lions attack throughout the first session and give Bob Rollins something to once again smile about. Bob’s smile soon faded sadly, with Mendel, Hole and Jack ‘Cubby’ Ritchie (0) departing in quick fashion to leave a slightly sour taste on our palate’s as we tucked into Frankfurt’s, sausage rolls and Calippo’s. It truly was a tea for the ages. Back to the cricket, and Jacob ‘Where’s my Wallet?’ O’Sullivan (7) and Taylor ‘Pablo Escobar’ Beatty (29) set about guiding the Waratahs towards the promised-land post-tea. These two incredibly stylish cameos’ came to an end with the game evenly poised at 5/160. Enter NSW domestic First-Class, ODI and T20 superstar Michael ‘The Better’ Edwards. Edwards (43) compiled what has often been described since as the best ever innings in 3rd grade by a currently contracted NSW player. Edwards continually manipulated the field with ease and cleared the rope on a truly remarkable, single occasion. At the other end, Zach ‘why is there a H on the end?’ Trewartha dismantled the Lions with even more class. Trewartha (50) punished anything short, anything full, and frankly anything on a good length with some incredible shots that made us reflect on his days in the Waratahs 1st XI T20 side. From this point, the Waratahs looked to launch late, with Captain McLachlan (27) almost wrecking Beatty’s day entirely by passing his score, and Brad ‘R&B Friday’s’ Wilson (6) striking at a Chris Gayle-like 200 to end the day. So it ended all out for 277 on the final ball for the Waratahs. A fantastic score that sets us up for 6 points, if a disciplined bowling performance can be achieved next week. Watch this space for a victory update in a week. ourth Grade made the trip out to Fairfield oval looking to extend there rich vain of form. With such a long journey, many members chose to car pool. Thankfully with Jesse (the Moff) Moffat dropping down from 3’s there were a abundance of uber drivers on hand. After a solid warm up including a physical game of touch with Alec Duly (pipes) thinking more of a rugby game to be played rather then cricket, the boys were sent into bat on a wicket and field that was rather suspect. Cohen and Gummer opened looking to see a solid platform. Unfortunately for Cohen after being burnt by Joel (slender) Davies in the warm up he looked to show off his speed, unfortunately cooking himself short. Gumms was joined by Dom Wheeler, with both batsmen looking to bat long into the day. Both looked to score runs, however with a slow pith and outfield the going back followed suit. Both batsmen looked at ease and the score continued to climb. Unfortunately for don with the score past 60 he plays over to play with a little bit to much intent and was caught a mid on. Gumms was joined by Pipes, the score continued to rise steadily heading into tea. Heading into the tea break Manly was poised to launch in the afternoon session with the loss of only two wickets. Coming out of tea Gumms and a fired up pipes. 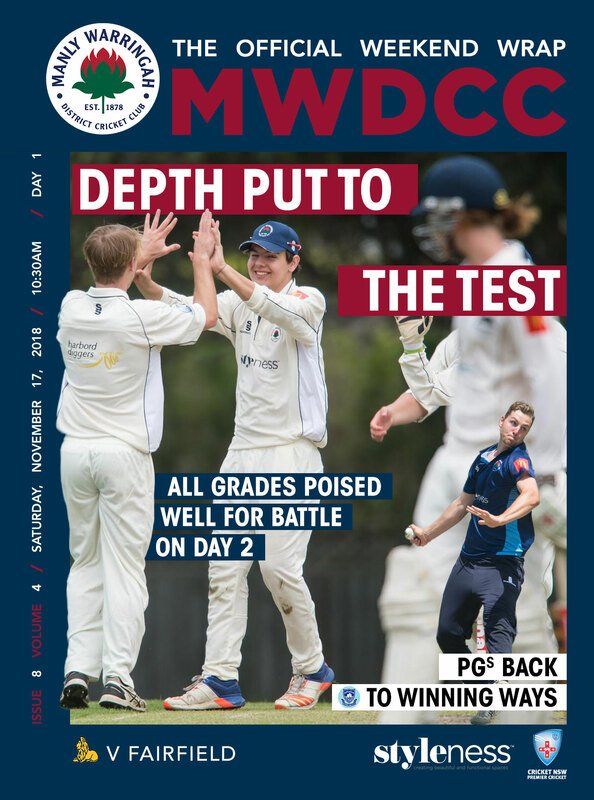 Looked to up the scoring with Gumms bringing up his 50.
sunny day, lively atmosphere and a good cricket wicket greeted 5th grade on Saturday at Mike Pawley Oval as we looked to continue on last week’s bonus point victory. We welcomed Joel Mason into the side and despite losing Aidan Bennett to 4s after a good showing last week, we had a good side on paper. With skipper Dylan marshall losing the toss we were sent into the field. Jack Hobson and Ben Falconer opened up and Hobson immediately showed his talent with some quick and accurate fast bowling. This particular reporter was quite impressed with his bowling all day. Falcs was a little wayward to start with as he hadn’t bowled in quite a while but settled into a rhythm eventually and bowled some good spells and was great in the field and with advice all day. Hobson got the first wicket, hitting the top of off stump, and then Falconer got a wicket caught at 2nd slip. Jordan Brewster and Marshall came into the attack with Marshall immediately getting an LBW. When Marshall got his 2nd caught by Morley, Fairfield were 4 for 55 off 27 overs. 6 overs to bat and we saw out the day comfortably, finishing at 0/16. Good day for 5s with all bowlers sticking to their guns and good energy in the field. A few really tough, one hand chances were put down but all in all the catching was very good. Our ground fielding was OK with easy single’s in the ring being something we need to work on, but this improved as the day went on. Looking forward to a big run chase next week to bring home 6 points. PG’s boys rocked up to a freshly shaven manly oval on a beautiful spring day aiming to collect a win off of a few disappointing loses. Losing Jack Edwards to shield duties brought in exciting quick Ryan Hadley playing his first games for the blues who not only bowls quick but also provided communal pistachios for the sideline lads. Winning the toss and batting first Matty Brewster and Aaron Beard looked to combat the swing of the regulation white ball early on. Brewster managed to borrow an array of team mates gear before he was unluckily caught down the leg side which he still to this day claims was bat on pad action. Beardy battled on but the quick wickets of Foster and Davies up the top saw the blues in a period of bother. At 6/59 Beardy proved to the boys that gritty cricket and will power was the only was to combat the low deck at Manly Oval before he departed for a well made 48. Enter Joe graham, known for his ridiculously hard hitting and aggression, Joey played one of the smarter innings in his career placing well bowled balls in the gaps and hitting balls that needed to be hit into the pine trees. Supported by Hads at the end the manly boys found their way to a total of 193 which we were confident in defending. After a trip to the Vietnamese bakery and Guzman’s the boys were off the defend with Hads and Jake Carden opening the bowling. Excellent precision and stump to stump bowling saw Jake claim the first wicket of the opener LBW and Jake let him know how he felt. The first twenty five overs consisted of dry tight bowling from the likes of the openers, Hamish Starr, captain Joel foster and Joey graham and after the prized wicket of Aiden Bariol the boys were on top of the game. Isaiah Vumbaca bowled his mixed bag of lollies and the day ended with Foz taking a well deserved 4 fa. The boys running away with a bonus point win felt better than the cold beers sliding down every neck of the lads at the end of the game.